Growing Within: A look of what my internship has done for my soul! I know it sounds really, really corny when I mention what this sort of internship has done for me personally when speaking to my family or friends but I thought I should surely tie it to all my posts and comments over my summer weeks spent with the Mahaffie organization. My mentor, Dr. Cantwell believed that I was ready to seek out that opportunity and validated every word I had spoke on my reasoning of why I thought I needed to explore this opportunity. This shot a huge motivation spark or drive inside of me to go outside the classroom, explore new territory, and immerse myself within the community. It has been a community that has been filled with historians, supportive staff, and of course loads of guests. To this point, I have grown immensely, example being- I am more open and vocal among the guests and just taking more risks even if it does not always pan out! This is one area I have felt that I was extremely weak in and I can now say that I the tide has turn in my favor. I will need the tools learned and hashed out moments to move forward in this sort of field-I don’t want it to hold me back. Taking the lead was another aspect, I had always been a follower-I have simply learned during this internship-sometimes following just doesn’t work. Be a leader and outspoken when the time arises! These are feats I have captured and leaving soon–I don’t want these traits to disappear along with my internship day. Till next post. 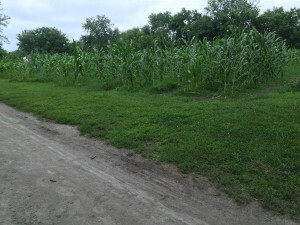 Look our corn fields are growing, growing, and growing!!! This entry was posted in HistoryMaking and tagged Mahaffie Stage Coach and Farmstead on July 29, 2015 by Katherine Miller.